As I read this passage a couple days ago, once again I was awed by the knowledge of God's love. Despite the unhappy struggles we all go through during our lifetime, God prevails. He does give us life after death; He does know our sufferings, and WILL wipe away our tears. A couple of weeks ago, as Meg and I were camped above the Snake River in Hells Canyon, a hummingbird whizzed back and forth in the early evening light. I clicked quickly, hoping I might come close to capturing the moment on camera. This hummer is obviously not in focus, but its glow is mystical. God's presence is mystical; it is quiet; it is "be still land know I am God." 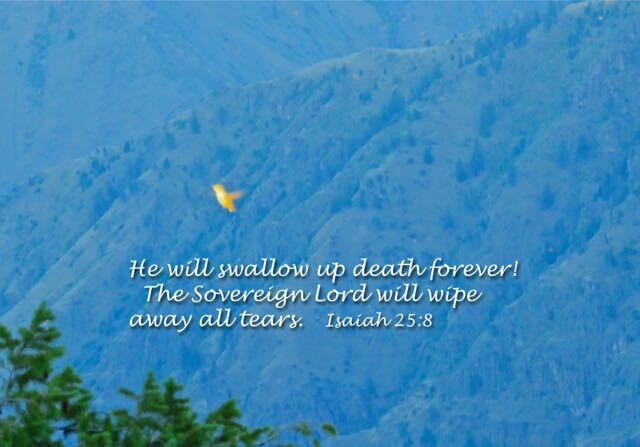 And, it is His gift to us that He will "wipe every tear from our eyes!"